Serial Entrepreneur Andrew Jenkinson is Director and Co-founder of Interactive experience company vStream, Creative ad agency, Vocal, production company, Visual, and Interactive Sports Experience platform, The Cube (launched at Super Bowl 50). vStream have pioneered the AR and VR space globally working with the worlds biggets brands to tell stories using cutting edge technology. vStream develop interactive experiences for brands in the sports and retail space, specialising in innovation and worlds first experiences. Internationally acclaimed for its creativity and technical vision, vStream has created interactive experiences for Aviva Stadium, Ireland (where you get to experience what it’s like to play rugby for Ireland), McLaren F1, UK (an innovation centre with gesture controlled holograms of F1 cars), Epson, Japan (an F1 augmented reality fan experience) and launched an interactive experience product with SAP at Super Bowl 50 in Levi’s Stadium, San Francisco in February 2016.
vStream latest VR and AR experiences see you taking a tour of the human heart for Pfizer, get live AR data streams while your are courtside at the LA Lakers, and see under the hood of the new A7 for Audi with Microsoft Hololens. vStream is government supported for R&D and has offices in Dublin, London & New York. 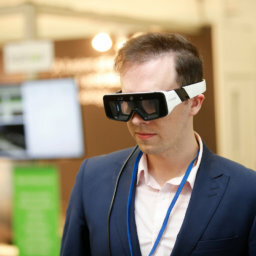 Andrew holds a BSc in Computer Applications from Dublin City University and a Masters in Innovation & Technology Management from The Smurfit School of Business. 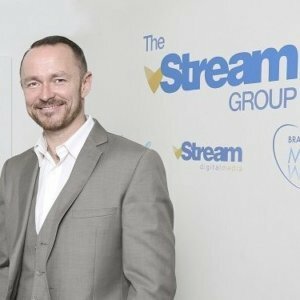 Prior to founding The vStream Group of companies with childhood friend Niall O’Driscoll, Andrew was a founding member of Irish software startup SteelTrace which was acquired by US Multinational Compuware for $20M in 2006. Andrew has received significant award recognition including Internet Marketer of the year, Entrepreneur of the year (European Business Awards) and Irish Times Innovation Awards. Andrew is a keen musician, father of 3, and loves anything with an engine!